A protester wearing a mask of U.S. President Donald Trump, center, performs with cut-out photos of North Korean leader Kim Jong Un and South Korean President Moon Jae-in, right, during a rally against the United States' policies against North Korea near the U.S. embassy in Seoul, South Korea, May 25, 2018. The signs read "Apology." North Korea and its neighbors in the region reacted with caution to U.S. President Donald Trump’s decision Thursday to cancel the U.S.- North Korea nuclear summit. 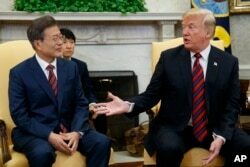 North Korean Vice Foreign Minister Kim Kye Gwan said in a statement released by the North’s central news agency (KCNA) that his country remains open to resolving problems with the United States “whenever and however,” and offered praise for President Trump’s diplomatic engagement efforts. “We had held in high regards President Trump’s efforts, unprecedented by any other president, to create a historic North Korea-U.S. summit,” said the vice foreign minister in a statement released Friday by KCNA. 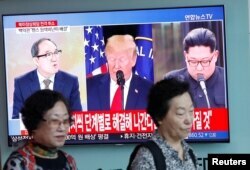 Women walk past a TV broadcast about the canceled summit between the U.S. and North Korea, in Seoul, South Korea, May 25, 2018. The conciliatory tone that came from Vice Foreign Minister Kim stands in sharp contrast to earlier criticisms, insults and threats made by another North Korean official that prompted Trump to cancel the June summit in Singapore with North Korean leader Kim Jong Un. On Thursday North Korean Vice Foreign Minister Choe Son Hui called U.S. Vice President Mike Pence a “political dummy” and threatened a “nuclear-to-nuclear showdown” with the U.S. over comments made by Pence calling for North Korea to follow the Libya denuclearization model. The Libya model refers to the rapid and complete dismantlement of that country’s nuclear program in 2003 and 2004, before the easing of any sanctions. But North Korea is acutely aware that Libyan leader Muammar Gaddafi was overthrown and killed by his own people a few years later, with support from a multinational military coalition that included the United States. North Korean leader Kim Jong Un shakes hands with U.S. Secretary of State Mike Pompeo, May 9, 2018, released by North Korea's Korean Central News Agency (KCNA) in Pyongyang. Pyongyang has called for a more incremental process that links concessions to partial nuclear reductions and postpones complete denuclearization until its undefined security demands are met. Trump blamed the “tremendous anger and open hostility” from Pyongyang for forcing the cancelation of the summit, but many analysts say the issue was more about substance over tone and the unbridgeable gap between the two denuclearization positions. But North Korea’s measured reaction to Trump’s rejection letter also offered the opportunity for the summit to be held in the future, raising hope that diplomatic progress is still possible. “I think it is worth positively evaluating North Korea showing its willingness to continue the talks with the U.S., while calmly assessing the current situation,” said Kim Yong-hyun, a professor of North Korean studies at Dongguk University in Seoul. President Donald Trump meets with South Korean President Moon Jae-In in the Oval Office of the White House, May 22, 2018, in Washington. Trump reportedly made the decision to withdraw from the summit without consulting other key countries in the region affected by the North Korea nuclear threat. South Korean President Moon Jae-in held a late night national security meeting to assess the fallout from the summit cancelation. Moon reportedly said he was “perplexed” by the decision to cancel and urged Trump and Kim to communicate directly to resolve the impasse. Moon had been instrumental in facilitating U.S.-North Korea talks by persuading Kim to agree to a broad denuclearization goal at the recent inter-Korean summit. On Friday, Unification Minister Cho Myoung-gyon said South Korea would continue to strive to fulfill the peace building goals of that summit, and said he believes North Korea also remains committed to finding a peaceful solution to the nuclear standoff. “It appears that (the North) remains sincere in implementing the agreement and making efforts on denuclearization and peace building,” the unification minister said. WATCH: Trump Pulls Out of Summit With N. Korea: What's Next? Trump Pulls Out of Summit With N. Korea: What's Next? In Tokyo, Japanese Chief Cabinet Secretary Yoshihide Suga voiced support for President Trump’s decision to pull out of the summit with North Korea and called for continued enforcement of the United Nations sanctions in place that ban 90 percent of trade with the North. “In order for North Korea to change their policies, it is necessary for Japan and the U.S. and South Korea to continue to apply pressure, including the United Nations sanctions and importantly with the nations that supported these (the sanctions), including China and Russia,” Suga said. North Korean leader Kim Jong Un meets with China's President Xi Jinping, in Dalian, China in this undated photo released on May 9, 2018 by North Korea's Korean Central News Agency (KCNA). However, President Trump had earlier suggested that China may have emboldened the Kim government to take a more confrontational position toward denuclearization talks. Trump said he noticed a change in attitude from the North Korean side after the second Kim meeting with Chinese President Xi Jinping this month, and later on Twitter urged China to maintain strong sanctions enforcement. Nearly all North Korean trade goes through China, and there have been observational reports of increased trade along the border region, although Beijing denies it has eased sanctions restrictions. However it would not be surprising for Beijing to allow increased informal trade with Pyongyang, given Kim’s improved relationship with Xi, and the unilateral good faith measures taken by the North that include the destruction of it nuclear test site on Thursday, the release of U.S. prisoners, and the continued suspension of further nuclear and missile tests. “Although China publicly says that it is fully following the U.N. sanctions against North Korea, it will ease the sanction compared to the past in the process of improving the relations with North Korea,” said Seo Jeong-kyung, a professor with the Sungkyun Institute of China Studies in Seoul. Russian President Vladimir Putin said, “we took this news with regret,” in reacting to Trump’s announcement canceling the North Korea summit. He also voiced support for his North Korean ally, saying Kim had done “everything that he had promised in advance, even blowing up the tunnels and shafts” of his country’s nuclear testing site. Lee Yoon-jee in Seoul contributed to this report.